The project in western Cuiaba was launched in the spring of 2010, when demolition of the outdated Verdão began. Early groundbreaking was expected to result with delivery already in 2012, long before the 2014 World Cup, for which the stadium was commissioned. However, late shipments, accidents and payment deadlocks led to immense delays. In fact, the stadium wasn’t completely finished in time for the 2014 FIFA event, despite efforts by 1,800 workers on site. First games at Arena Pantanal, treated as test-events ahead of the summer tournament, showed one more issue: lack of demand for such a big stadium. This problem was raised and addressed before works even began and GCP Arquitetos created demountable upper stands on both ends. Legacy use may therefore include dismantling some sections and reducing size by up to 18,000 seats. The design also includes local weather conditions, assuring increased natural ventilation through open corners and openwork external wrap. Initial plan allowed to even place gardens inside the stadium, but that idea didn’t come to fruition. Along with growing delays, the project’s budget also grew a lot. While early estimates gave the cost at R$342 million, the final budget went up to R$570 million, of which roughly 60% were provided by federal government and the remainder covered by the city. 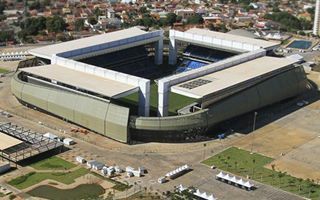 Early declarations depicted the stadium as future home for numerous clubs, but upon opening only two were considered tenants for Arena Pantanal: Mixto and Cuiaba EC. Although the lack of strong anchor tenant was controversial, the stadium was built to host diverse events and already when opened allowed Cuiaba to be part of both the World Cup and 2016 Olympics.